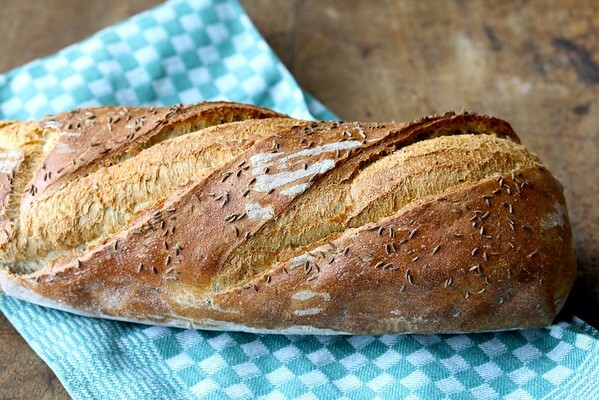 This Eastern European Rye Bread is soft and light with a crispy crust. It is perfect for deli style sandwiches. I was a little nervous about this bread at first, mostly because the dough requires quite a bit of kneading, which is something that normally turns rye dough into glue (at least for me). The dough started out really sticky and glue-like, but an amazing thing happened. After about eight minutes of kneading with the stand mixer on medium speed, the dough became smooth and easy to work with. This bread also managed to survive a major goof on my part. After the first rise, I carefully shaped the dough and placed it in a heavily floured towel for the final rise. Then I realized that there should have been a second rise before shaping. Doh! I quickly pulled the loaf out of the well flowered dish towel sling I'd placed it in to rise, rubbed it with wet hands to try to absorb the flour coating into the dough, and gave it a couple of kneads. Miracle of miracles, it rose up again!! 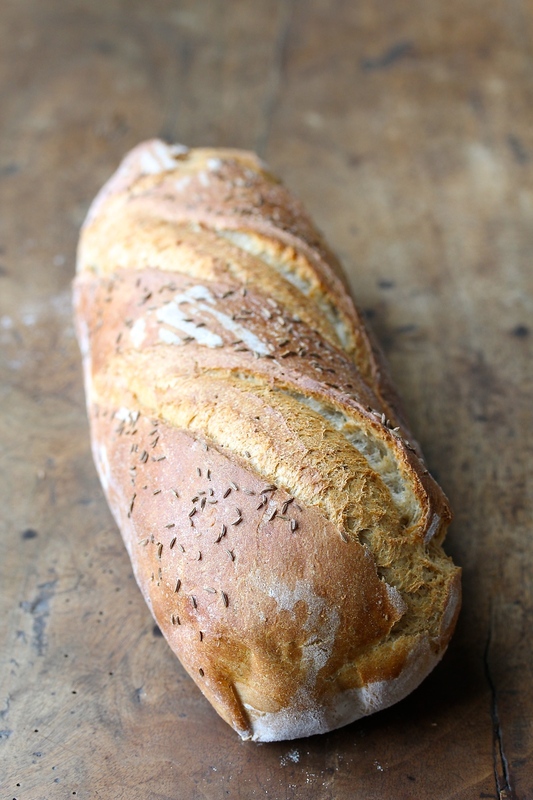 Regarding the dish towel "sling," there's a photo of how I suspended a loaf like this in this post. It's pretty fun explaining to your family why it's hanging there. Bottom line? I loved how this bread turned out! It's probably the most success I've had with traditional deli rye. Today, the Tuesdays with Dorie group is baking Eastern European Rye from the wonderful book, Baking with Julia (as in Julia Child) by Dorie Greenspan. To see how other bakers fared, follow this link. Place the yeast in the bowl of a stand mixer, and add 1/2 C of the water and a pinch of the sugar. Let sit for 5 minutes. Add the rest of the water, the rest of the sugar, the salt, and the shortening. Add the rye flour and caraway seeds to the bowl and stir with a spoon until it is fully incorporated. Move the bowl to the mixer. Using the dough hook, mix in the vital wheat gluten. Add 2 1/2 C of the bread flour, and mix on medium low, adding more flour until the dough is soft and clears the sides of the bowl, about 3 minutes. Knead the dough on medium speed for about 8 minutes, until the dough is smooth. I mixed mine for the full eight minutes. Place the dough into an oiled bowl, cover, and let rise for about 90 minutes, until doubled. Deflate the dough and let it rise again, until doubled, about 45 minutes. Press the dough into a 7 inch by 9 inch rectangle, and, beginning with a shorter side, roll it into a log, sealing the dough as you roll it up. Tuck in the ends, place it in a floured towel, and suspend it from a drawer (I just tuck the towel into the drawer and shut the drawer). For detailed shaping instructions, see Cathy's post here. Let rise for 30 minutes. It will be quite puffy. Preheat the oven to 425 degrees F and set it up for steam (I use a broiler pan on the lowest rack, in which I add boiling water. I also spray the oven walls with water after loading the bread). 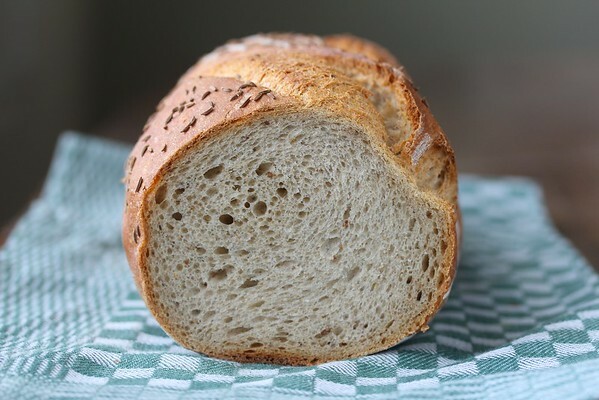 When the loaf is ready, brush it with the egg white and water wash, and sprinkle with caraway seeds. Slash the dough three times on the diagonal. Load the loaf onto the baking stone or baking sheet, and bake for 30 minutes. Turn the oven down to 375 degrees, and bake for 10 to 15 minutes more, until it reaches an internal temperature of 200 degrees F.
Turn the oven off, and let the loaves sit for 5 minutes more. you may have goofed, but you have a way better looking loaf than I have. I love the way yours kept such a cylindrical shape! Maybe the goof helped, lol! Beautiful loaf! I agree that this is a great tasting loaf of bread. Thanks for posting the recipe. Thanks Carlene! I think the vital wheat gluten helped. Gorgeous loaf!! Love the slash lines. Thanks so much for the shout out. That means a lot coming from a bread expert, such as yourself. Awww. You are too kind. Your post was amazing! Absolutely gorgeous, Karen. I always love your bread posts.